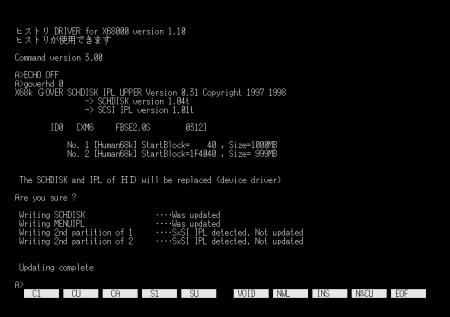 By default the X68000 allows us to use hard drive capacity only up to 1GB (1016 Mb). Trying to create a larger partition or a partition which uses data past that point will result data corruption. The solution is to use GOVERHD. This program will apply a set of patches that will enable you to use up to 2GB of hard disk space and this tutorial will show you how to create two 1GB partitions and patch them with GOVERHD. You can create more than two partitions, if necessary, but keep in mind that the starting point of last partition must not exceed the 1016 Mb barrier or otherwise the system will not be able to boot from it. First of all download the MasterDisk V3 and boot from it. It features Format.X, Scsiformat.X and Goverhd.x which are all translated to English. 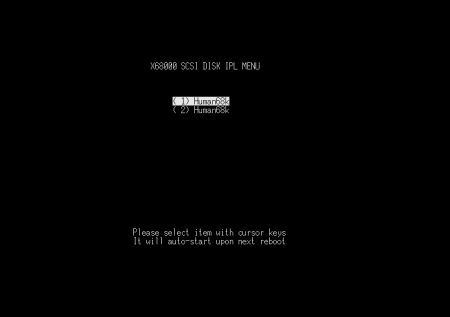 Reboot the system after creating the partitions, type “GOVERHD ” followed by the ID number of your hard drive and press Enter. Answer “Y” when prompted and you should see something similar to the following screens. Press “HELP” key right after reset to access the boot menu and select a different partition. Keep the scene alive !